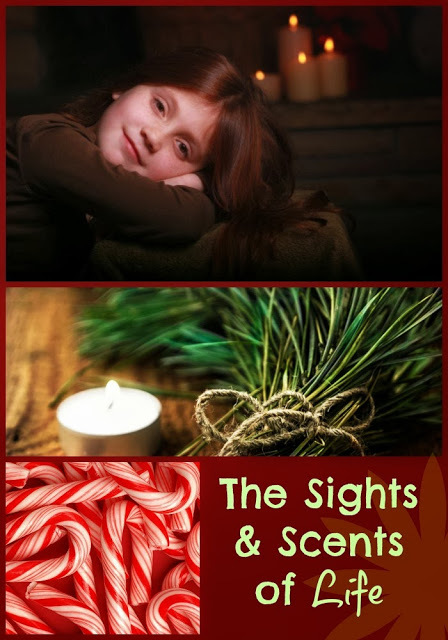 Carolann E: The smell of a live Christmas tree. I used to lay on my tummy and play with the little plastic town and the train that my dad set up every year and sing Christmas carols. Jennifer C: The smell of burning leaves always makes me think of my dad when I was little. There are also certain smells that are like a mixture of chalk and glue and blackboards that make me feel like I’m back in elementary school. Also, a cool breeze some mornings bring me back to getting ready for school time. Shannon: The smell of my grandma’s perfume. Jenny B: Cooking smells like cookies and cakes and buns that mum use to make. Melinda S: A spoon stirring something in a glass jar. My mom mixed up a big jar of Tang every morning for breakfast. I usually woke up to that sound. Cooper M: Fresh mown hay takes me back to summer visits to my grandparents farm. Martha A: The smell of homemade spaghetti sauce simmering on the stove. Kathy P: Tangerines. Our Church made goodie bags at Christmas. They included a tangerine (or orange), hard candy, chocolate candy, nuts and other goodies. We had so much working at the assembly line filling the white paper bags for Christmas! Burning candles take me back to the Christmas candlelight service on Christmas Eve. Anne: Rain/sprinklers–that fresh scent on a hot day. Warm asphalt takes me back to the little town where my grandmother ran a little motel. She and I walked all over that little town, and the asphalt was soft and warm in summer. Also, the plastic smell of new dolls (i.e. Barbies) at Christmas. Lesley: Mom’s pot roast . . . Love it! Dawn: the smell of the paper mill! Tammy: Orange blossoms! I grew up by a grove in Florida. Jennifer: Um . . . We lived next to a dairy farm. Marie: Mom’s homemade cinnamon rolls and her hairspray . . . she used to use Adorn. I remember lying down on her bed and her pillow always had the scent of Adorn. Symone: sound of a cheese slicer lol! Donna: powder—the only make-up my mom ever wore. Kimberly Brown: The smell of harvest. I grew up on a grain farm. These are just a fraction of the responses. I found so many of them taking me back to childhood too—that plastic smell of a new baby doll, the smell of play dough, and of Old Spice. No matter how old we are or where we live, common sights and smells unite us! The same is true when we read fiction. The sights and scents create a common bond within the pages. They connect the writer, the characters, and the readers by the simple, everyday things that stir memories. I love the pine/cinnamon smell. Right now I’m burning some green candles called “Spruce in the Snow” and have a Partylite melt called “Poinsettia & Musk” burning in my kitchen. They were going during my “Christmas Gift for Rose” brunch today and gave us a lovely Christmas scent while we were enjoying each other’s company. Oh, I love the scent of candles! I just need to remember to light them! I smell my childhood whenever I smell cigarette smoke – like the fire we always had up the river at our grandparent’s shack when we went there every easter. My dad was a smoker. I think of him when I smell cigarette smoke.